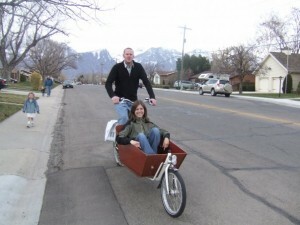 As all of you know, the Utah Bicycle Summit is steadily approaching. However, many of you may not know that the National Bicycle Summit just ended last week. We are lucky to have had Brad Woods, a local bicycle advocate, there to represent Utah Valley. Brad wrote up a great re-cap of everything that went on. We have a friend in Ray LaHood. That was the take-away message from the opening of the 2011 National Bike Summit. For those who don’t know, Ray LaHood is the Republican Secretary of Transportation in the Obama administration. He is responsible for all transportation matters in this country, and he is a big supporter of cycling. He gave his remarks to a crowd of over 800 advocates from around the country, and even some from Canada! This was the biggest summit ever, necessitating a move to a new facility this year, and it was so large, that with an even larger crowd anticipated for 2012, an even larger facility will have to be found for the next one! Day two started out with a breakfast speech by the Director of Let’s Move, an initiative of First Lady Michelle Obama that aims to get kids active and healthy. With many more kids coming down with adult diseases due to obesity and inactivity, cycling can play a major role in reversing the trend. The next breakfast speaker was the Secretary of the Interior, Ken Salazar. He spoke about wild lands and urban parks, and the place that cycling has in bringing youth out doors and helping them get active. That seemed to be something of a theme at this Summit. After the breakfast talks, it was on to the break-out sessions. The first one I attended was on High School Mountain Biking. I’m really excited for the possibilities for High Schools here in Utah. The next session was on Zero Fatalities. Frankly, I was mostly disappointed in this one. It was mostly car people talking about how everyone else needs to take responsibility for cars killing them. I wasn’t to impressed. There were some great comments from members of the audience, which was quite respectful. Lunch was next, and we had a presentation from IMBA, and the League of American Bicyclists gave out its Bicycle Friendly Business and University awards for this half of the year. I’m very proud to say that Mad Dog Cycles in Orem and Provo was awarded a Gold level Bicycle Friendly Business award. After lunch was over, the third and final break-out sessions happened, and I went to one on getting metro areas ready for innovation in bicycle facilities and planning. Announced at the Summit was the new NACTO guide on bicycle facilities. This guide is extremely progressive, and the hope is that the governing bodies within the USDOT will allow more of the European style facilities in this country. State delegation coordination was next, and we had 5 people from Utah this year! I think that is a record. Of course, that is quite dismal if you ask me, so if you are reading this, start saving your pennies now so you can come next year! There are always party’s at night, and I went to one both Tuesday and Wednesday evenings. Thursday was our day on the Hill, and it was pouring rain! We all got soaked! The meetings were good though. I know you are wondering where Utah’s delegation stands on bicycle issues. The lone Democrat from Utah is very supportive, some of the rest are nice about it, and the rest tolerate our being there, but don’t like us to much, yet. We are going to be meeting with them again, and we’ll win them over. How can you not like bikes? There was a party at the end of the day on Thursday, and that was it for the summit. Friday my plane didn’t leave until late in the day, so I borrowed a Brompton folding bike, and toured the city. I have to tell you all, that a folding bike and the subway make getting around a city so easy it is silly to drive. I wish we had better transit here in Utah Valley. I hope this has whet your appetite a bit, because Utah’s Bike Summit is coming up at the end of April! I hope to see you all there! Brad, thank you so much for the great write up and all the great work you do for Utah. Great overview of your experience! Too bad about the zero fatality session. It’s an idea with such great potential and it’s just so obvious that it should be our first priority! Thanks for telling us about the summit, Brad! It’s so good to have someone from the valley attending these things!